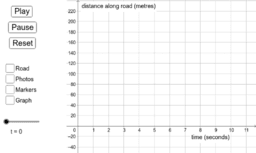 These traffic simulations originally featured in the DfE Standards Unit resource: Interpreting Distance-Time Graphs with a Computer. They were designed so that students could interpret linear and non-linear distance-time graphs. These are the original 20 simulations that featured in the Java program Traffic (rewritten in GeoGebra). The notes and guidance for teachers can be found at: https://www.stem.org.uk/rxucg.